Here’s how XRP/USD has failed to keep up the downward trend line. 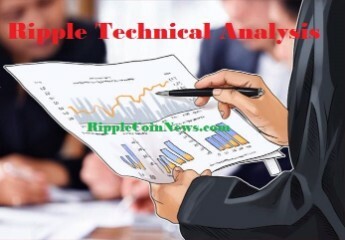 I was saying in the latest technical analysis that the XRP/USD parity will not be able to keep above the downward trend line, if the BTC will have a downward break, the support level at $3900. Here is the BTC broke the support level at $3900 and dropped yesterday to $3740usd. At the time I publish this analysis (h 0.15) on the BTC, there is a slight recovery. Here’s how, again, XRP/USD is synchronized with the downward movement of the BTC. Lately, any attempt to recover XRP/USD has been neutralized by Bitcoin’s downward move. Yesterday XRP / USD tested the S1 support $0.19usd again. If the downward movement on the BTC will continue XRP/USD will break the support level S1 $0,19usd and will descend to S2 $0,175usd. However, we should know what levels of support we have on the BTC. To what level of price can BTC come down in the short-term? The last minimum level on the BTC was $3600 (August 22). It is possible that the price will try to form a new support level at $3600. From $3600, we will probably have a recovery on the BTC. 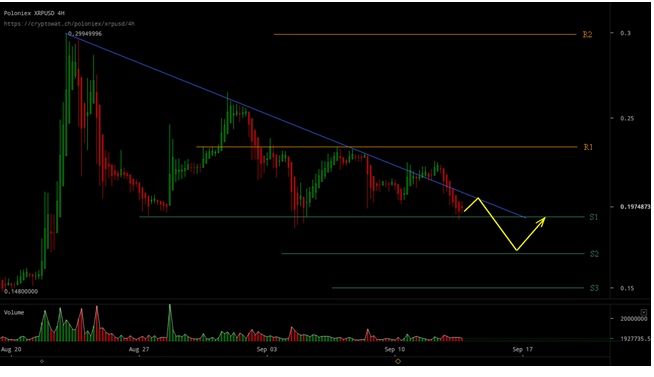 At this point, a downward trend channel was formed on the BTC. If the BTC will not form a support area at $3600usd, the next level at which it can stop is $2900usd (previous resistance area). XRP/USD will follow BTC’s move in the coming days. A decoupling from the BTC movement can only be produced, except in the case of really good news. For the next two days, the possible evolution of the XRP/USD price is drawn in yellow on the chart. For those who want to buy XRP/USD, a suitable strategy for the moment would be buying at certain predetermined price levels. Support levels S1- S3 are good buying areas. Money management must be very accurate. For example: buy 20% of the total amount available at S1. If the price goes down to S2, buy with 30% of the total amount. If the price goes down to S3, buy with the remaining 50%.